Dermoid cysts are rare lesions, particularly in children. 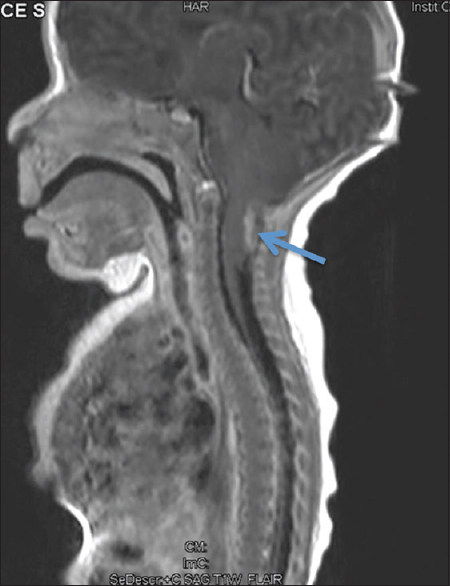 Chiari II malformations are seen in patients with myelomeningocele. Here, we present a child with Chiari II malformation who, during a Chiari II decompression, was found to have a dermoid cyst. To the best of our knowledge, this is the first such case ever reported. The first posterior fossa dermoid cyst was reported in 1860. Dermoid cysts are slow growing, congenital masses that are encompassed by a capsule consisting of both epidermal and dermal derivatives. They are thought to arise from the totipotent ectodermal cells that fail to separate from the developing neural tube., Dermoids account for approximately 1% of all mass lesions in the pediatric population. The posterior fossa is the most common location for dermoid cysts, accounting for 0.03%–0.7% of all intracranial tumors. Although they are nonneoplastic, they can present with signs and symptoms secondary to mass effect on the brain, cranial nerves and vessels, aseptic meningitis, hydrocephalus, intracranial hypertension, seizures, and visual loss., Surgery is the treatment of choice, and the goal is resection of the entire cyst to avoid regrowth. Dermoid cysts are usually found in the midline. In 1891, Hans Chiari published a series on hindbrain herniations based on autopsy findings where he found a distinct form of malformation exclusively in patients with myelomeningocele. Chiari II malformations were initially thought of as being the caudal displacement of the cerebellar vermis, brainstem, and fourth ventricle. However, it is now known that they represent a complex malformation involving both supratentorial and infratentorial components, in addition to the skull and vertebral elements. Coexistence of a Chiari II malformation and posterior fossa dermoid has, to the best of our knowledge, never been reported before. Herein, we report the incidental finding of a dermoid cyst found during a Chiari II malformation. A newborn with myelomeningocele (diagnosed by elevated maternal serum alpha-fetoprotein at 7.5 months, confirmed by ultrasound) was born at 39 weeks through C-section. On day 2 of life, the myelomeningocele was closed. Progressive distension of the anterior fontanelle with splitting of sutures occurred with hydrocephalus. Stridor was noted on day of life (DOL) 9, and a ventriculoperitoneal shunt was placed on DOL 10. The stridor improved somewhat after the shunt was placed, but never completely resolved. The patient returned at age 3.5 weeks with worsening stridor. The shunt was removed, and an external ventricular drain was placed to assure adequate cerebrospinal fluid diversion before potential Chiari II decompression. Three days later, we were unable to wean the patient's ventilator, despite a low setting of the Ebola virus disease. It was decided that a Chiari II decompression was warranted [Figure 1]. A C1–C3 laminectomy was performed, and the dura opened. 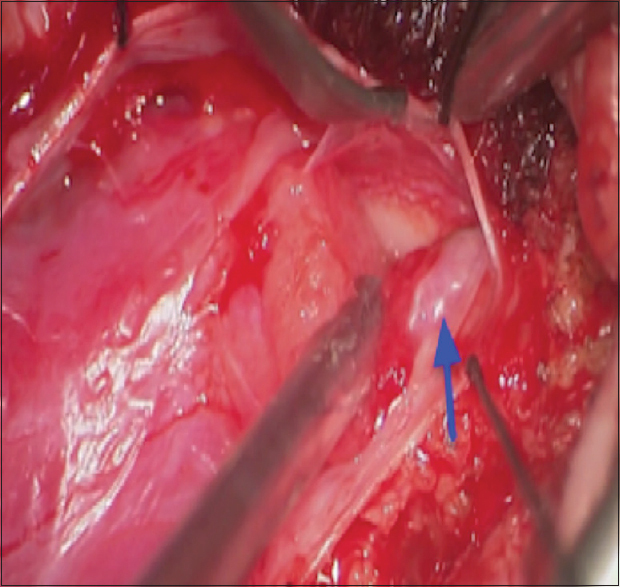 The extraventricular choroid plexus at the outlet of the fourth ventricle was cauterized. Deep to the choroid plexus, desquamated epithelium, and hair were observed [Figure 2]. The mass was resected and histologically found to be dermoid. The patient did not have significant improvement in their stridor and went on to have a tracheostomy placed, 3 weeks later. At 1-year follow-up, the patient was tolerating tube feeds and was gaining weight. 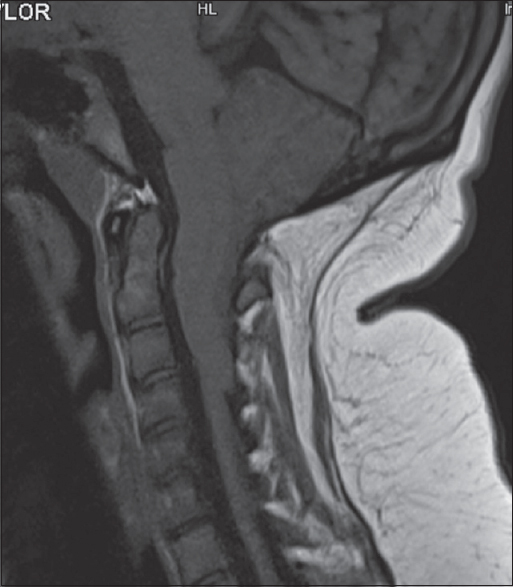 Follow-up scan at 10 years of age showed no signs of posterior fossa dermoid [Figure 3]. An intracranial dermoid cyst is a rare entity accounting for less than 1% of all intracranial tumors in children. Dermoids are composed of a thick fibrous capsule, which contains stratified squamous epithelium and are derived from ectodermal cell lineages only. The fluid within these cysts is composed of lipid metabolites, cholesterol crystals, and whorls of hair. No report on posterior fossa dermoids in Chiari II patients has been reported. Dermoid contents usually resemble fat on computed tomography and magnetic resonance imaging. The high density of cholesterol within a dermoid cyst is associated with T1-weighted imaging (WI) hyperintensity and T2-WI hypointensity. Diffusion-weighted imaging should be used for the diagnosis of dermoids. The solid component of the dermoid may lead to decreased diffusion in comparison to purely cystic lesions. Approximately 20% of dermoid cysts have calcium deposition. Ruptured dermoids lead to dermoid particles being dispersed into the subarachnoid space, and the involvement of the subarachnoid space and/or the meninges can result in vasospasm, hydrocephalus, or aseptic meningitis., Therefore, it is important to suspect such lesions in the posterior fossa, even in patients with Chiari II malformation. Lannelongue MM, Achard C. Treated congenital cyst. Paris; 1886. Caldarelli M, Massimi L, Kondageski C, Di Rocco C. Intracranial midline dermoid and epidermoid cysts in children. J Neurosurg 2004;100:473-80. Cobbs CS, Pitts LH, Wilson CB. Epidermoid and dermoid cysts of the posterior fossa. Clin Neurosurg 1997;44:511-28. Orakcioglu B, Halatsch ME, Fortunati M, Unterberg A, Yonekawa Y. Intracranial dermoid cysts: Variations of radiological and clinical features. Acta Neurochir (Wien) 2008;150:1227-34. Raghunath A, Indira Devi B, Bhat DI, Somanna S. Dermoid cysts of the posterior fossa – Morbid associations of a benign lesion. Br J Neurosurg 2013;27:765-71. Cesmebasi A, Loukas M, Hogan E, Kralovic S, Tubbs RS, Cohen-Gadol AA. The Chiari malformations: A review with emphasis on anatomical traits. Clin Anat 2015;28:184-94. Osborn AG, Preece MT. Intracranial cysts: Radiologic-pathologic correlation and imaging approach. Radiology 2006;239:650-64. Ciurea AV, Coman T, Tascu A, Ionescu V. Intradural dermoid tumor of the posterior fossa in a child with diastematobulbia. Surg Neurol 2005;63:571-5. Skovrlj B, Mascitelli JR, Steinberger JM, Weiss N. Progressive visual loss following rupture of an intracranial dermoid cyst. J Clin Neurosci 2014;21:159-61.